Process Plates (2014), twin-screen video, no sound, 6m11s. This piece is comprised of cinematic 'process plates', shot for the purpose of being back-projected to form the view from a train carriage window. This particular footage was shot in the 1940s by renowned cinematographer Ray Cory, but is now in the public domain. The footage has remained largely untouched, and has been edited only as much as was necessary to present it in this twin-screen arrangement, so as to allow comparison between takes. The subtle differences between different versions of the shot become exaggeratedly noticeable this way. 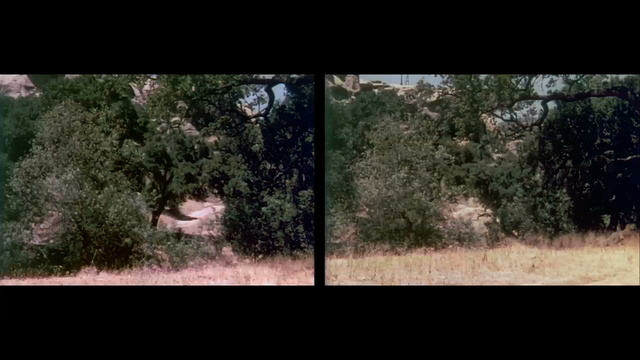 Some of these differences were likely a result of the specific demands of the scene that this footage would eventually become the backdrop for, but others reveal the particular environmental conditions on that particular day. Separated from their original cinematic function, these clips become curious tracking shots that ask us to pay attention to a specific but peculiarly structured passage through a landscape.